Our Luccia 1 Carat Round Cubic Zirconia Cathedral Criss Cross Solitaire Engagement Ring features a 6.5mm round brilliant Russian formula hand cut and hand polished diamond quality cubic zirconia center stone. 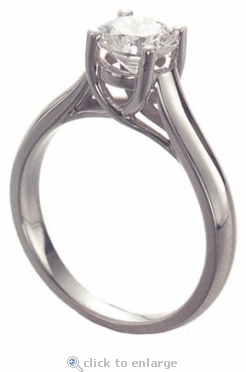 The stunning intertwined trellis cathedral styled mounting features integrated prongs that criss cross each other and then display the stunning round center man made diamond simulant cubic zirconia. When compared to a Tiffany Lucida style setting, you can see a similarity of the overall inspiration. This design is a slightly more petite version of our traditional Round Luccia Solitaire Engagement Ring. 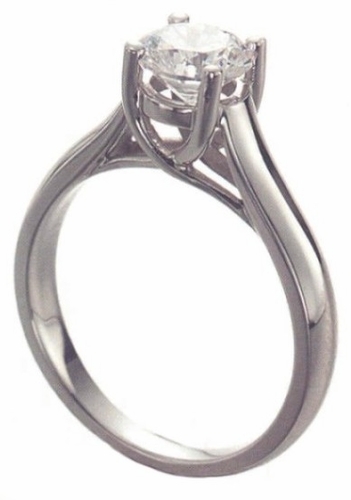 To view the heavier version of the Luccia Criss Cross Cathedral Solitaire see item R1800R1. The diamond quality cubic zirconia center stone is set in 14k solid white gold. The shank measures approximately 3mm in width at its widest point. Due to extremely low pricing, all clearance sales are final.